Our game is a turn-based shooter, Worms-like. 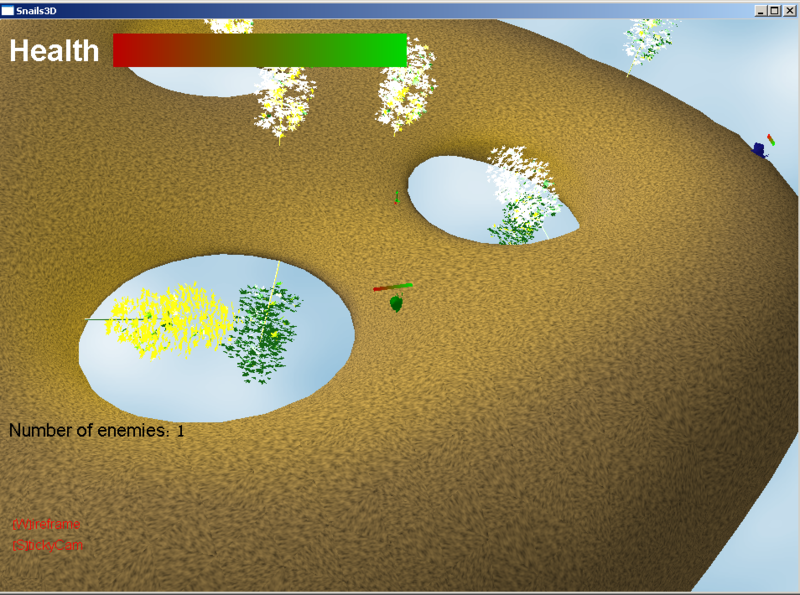 The players are supposed to walk on the face of a world mesh (a 3d structure), and shoot missiles at each other. When it comes to positioning and aligning 3D objects on top of other 3D objects, I must say I was overwhelmed by the complexity. Its really not that easy to do, but once you get the idea its easy. //   the new negative Z axis of our transformed object. //   positive X axis of our transformed object. //   look at vector and the old up vector. //   point along the negative Z axis. // Multiply onto current matrix stack. Another key point in our game is making the player character walk smoothly on the mesh. 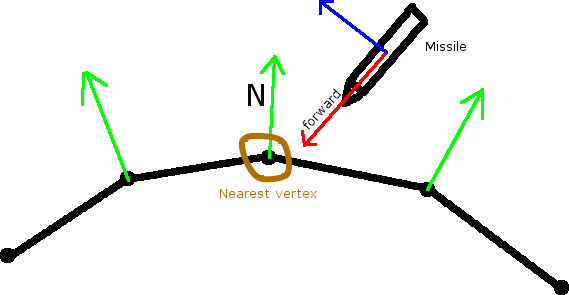 The instructions for this exercise were that we have to make the player either walk from vertex to vertex, from edge to edge or the most complicated option - an arbitrary point on the mesh to another. We chose to make the player walk from edge to edge. 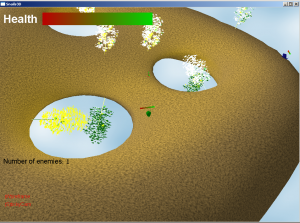 Say that the player object is on an edge. To make it walk to another edge we needed to know what are the possible edges that it could reach. For that we created a half-edge structure of the world mesh. Then when we query the structure we can get in constant time the neighboring edges to the player (typically the one-ring of both vertices of the current edge he's standing on). We only have to choose from the list of edges which edge the player should go to, and where on that edge he will "land". This is done by choosing the edge with the closest point to the approximation of the players next location. The player has a certain speed, meaning it can cover a certain distance in a given time. The approximate next location of the player is the distance it should cover in minimal time. We took a constant value. In the image you see the player object (snail), the ring of edges around the player that we check (green), the approximate next location (yellow), and the calculated next location (purple). We actually check what is the intersection point of the approximate edge with the line that goes from the player and in the forward direction. This is the point the player should be if it walked from his current position to that edge. //skip the opposite edge too. Of course when the player gets to his next location, he needs to get the correct up-direction and forward direction. This can be taken from the next edge's vertices that hold normals. Avoiding hitting other players. Done by not allowing 2 player to inhabit the same edge. One more interesting issue is the missiles impact on the world. Naturally, we'd like the missiles that hit the ground to make a dent in the world. Our solution was to take the 1-ring of the hit vertex, and lower all the vertices on the ring in the opposite direction to their normals. So far I've covered mesh oriented movement. Missiles, however, are not mesh-bound - they fly around "freely" above the mesh. To imitate gravity and a "steep course of flight" for the missiles, we use Bezier curves of either 3 or 4 keypoints. To calc a point on the curve all you need to know is the current time of flight. I've talked about what happens when a missile hits, and about the missile's course, but how do we know when the missile hits the ground? We have implemented this using a KD-tree over all the vertices in the world mesh, to check what is the closest vertex to the missile. When the missile gets close enough we check the dot product of the missile's location and the normal of the surface - when the sign flips the missile hit the ground. Particle systems are a decent way to simulate smoke, fire, water splashes and anything "particley". We ripped some C code from the net (I can't remember where, but it was GPLed), again, and ported it to Java. The only problem is that OpenGL can't really display particles, you need something that has some kind of surface, or a line. Other options are drawing GL_POINTs, or GLU spheres, but both options either don't look pleasing or are very costly in terms of performance. So we used GL_TRIANGLE_STRIP to draw small rectangles of random sizes as the particles. // This particular particle is alive. // This particular particle is dead. // distance so user can zoom in and out the particles. // will act as the alpha. // Draw the particle using triangle strips. // Map the texture and create the vertices for the particle. // Update the particles' properties. Note that we make sure the "particles" are blended into the buffer, as particles' color is fading as they near death.